Discussion in 'The Small Company Luthiers' started by wralph, Aug 12, 2008. Well she is here, and as you can see from viewing the pic below, my diagnosis is simple, hello my name is Raf and I am a teleholic. The K-line is the pink one in front and she is every bit as good as I hoped she would be. Let me start by saying that Chris was direct, responsive and easy to deal with, making the whole ordering process a breeze. The Guitar is an absolute keeper, it simply sings. It is set up perfectly and feels so comfortable, like I've been playing it for a long time. The sound: very articulate, balanced and warm. The Lollar PUs are balanced and cleaner sounding than I expected (Special on bridge and Vintage on neck). A little roll off of the tone pot and it darkens up as it should, and with the tone pot maxed out it twangs like it was born to do, without any overly bright harshness. I'm getting a pretty good clean "The Band" era Robbie Robertson tone through the ÷13 FTR37, just on the verge of break-up as I like it, and when pushed it growls with a nice warm even voice. Thourgh the Tweed Super, it's all raunchy R'n'R. I have to give you full props Chris, thanks very much. I'll try and get a little vid up if I can figure out the my crappy camera out. Here is a video, just doodling in the basement studio. I apologize for the sound quality, but it's just my crappy photo camera's mic pick up the sound. No effects, just straight into the amp. As I mentioned on the other forum, nice guitars and colours and your playing is very nice as well!! Hey wralph, the K-line sounds real fine through the eq channel on the FTR. I've got a FTR that I've been using a strat and LP through but thinking about a Lollar equipped tele as well. Would you be willing to do a clip of the K-line through the click channel? Thanks. Nice collection of colors. The new K-Line is my favorite of the bunch. My fave of the three you have there, sweet axe man. Congrats! What is up with you guys and your pink guitars. Am I just not in touch with my feminine side anymore? 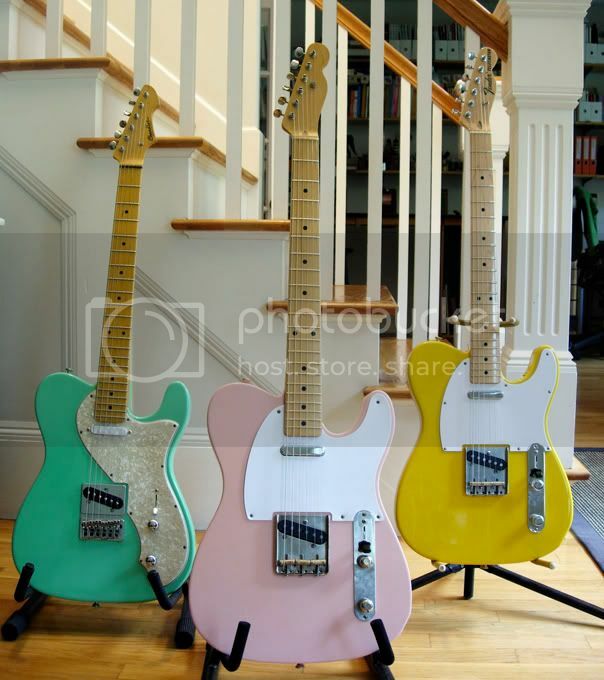 Shell Pink is my fave Fender Color. Congrats, that K-Line looks killer. Thanks for sharin', love that Shell Pink, Wow! Hey, nice playing on that video. I found myself listening all the way through and enjoyed.